I’m going to be entirely honest here and admit that my opinion on Stones of Blood diverges in a massive way from the general consensus. I don’t think the blend works well at all, and the serial doesn’t balance its elements at all consistently. After all, producer Peter Hinchcliffe had already demonstrated that you could effortlessly blend high-concept science-fiction and gothic horror with remarkable ease, most of his more famous stories combining the elements in some fashion. The most obvious example is The Ark in Space, but I’d argue that even more overtly gothic stories like Pyramids of Mars also have heavy enough science-fiction trappings (the logic puzzles, the nature of Sutekh) in order to count. So the idea of blending the two didn’t represent tying two old favourites together to make a new classic. However, my problem is more fundamental than that. Williams’ edict as producer was to move the show in a lighter and more comedic direction, in response to the concern from media watchdog groups over the violence and horror of the early Tom Baker stories. I have no problem with this direction, and I honestly quite enjoy it – I love The Androids of Tara precisely because of its silly whimsy. However, Williams knew that he’d never be allowed to air anything nearly as horrific or as tense as Hinchcliff seemed to get away with on a weekly basis, so it seems rather cynical to try to offer a homage that you know will be horribly watered down. There are a few horrific moments in the script, but most of them are diluted or watered down to the point where they lose any real impact. of the entire serial, the only time I even felt a little bit tense was when the rock monsters fed on two random campers in order to replenish their strength. 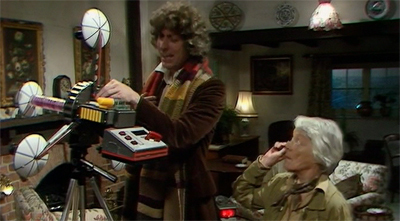 It was a wonderful scene, like something that could have been drawn from the opening of an early Tom Baker serial, but it ends up sticking out from the story like a sore thumb. The rest of the tense scenes feel overwhelmed by awkward elements of comedy, that don’t really sit particularly well – because they make the humour seem surreal and darker, but also because they make the violence less horrifying. When the Doctor stumbles across a murder, his proclamation that the victim has had their “skull smashed to pulp” has its impact reduced by the fact the character is covering K-9’s eyes. 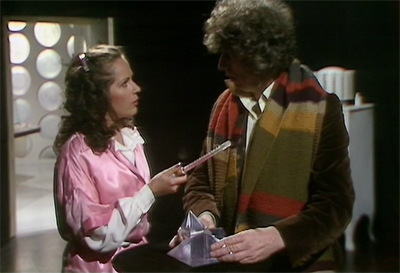 When the Doctor is about to become a victim of human sacrifice, there’s no sense of fear from Baker’s Doctor, who instead insists, “I hope that knife’s been sterilised!”Even the climax to the first episode feels like it has been drastically softened. Originally, Romana was to be pushed over the edge of the cliff by an alien in the form of… the Doctor! It’s a bit cliché, but it’s not a bad hook. Unfortunately Baker felt this would scare children, so the scene is changed to make it as generic and inoffensive as possible. It just lacks impact. It doesn’t help that the monsters look ridiculous. I think rock monsters that feed on blood represent a wonderfully pulpy concept – there’s something very trashy and exploitive about that. And I’ve found myself able to forgive a lot of the show’s special effects over the years. I think my dislike of the rock monsters stems from the way they’re shot. Again, there’s a conscious attempt to remove any hint of mystery or ambiguity. Once it becomes clear that there are killer rocks on the lose, they’re shot in a pedestrian matter-of-fact style, which doesn’t add an air of menace. Nor does the fact that the Doctor defeats one by dancing around like a bull fighter with his coat. The scene of the monsters feeding is so shocking precisely because of comedy like that. And the end of the adventure, with the Doctor petitioning some intergalactic legal minds for assistance, feels like it’s a parody of those old Star Trek adventures where the cast find themselves on trial and arguing in some cosmic court in favour of humanity. I have no problem with a Star Trek parody, but it feels a little strange to spend a third of a milestone episode of your own show making fun of another. The fact that Baker seems to come a little off the rails doesn’t help. He’s a fine comedic performer with great timing (all of which is superbly demonstrated by the next story… from the very same author), but the story just takes it too far. I don’t need Tom Baker to wear a silly wig while he’s supposedly arguing for his life. It’s a shame that all these larger elements don’t work, because a lot of the smaller ones do. I like the idea of the stones, and there’s also the rather wonderful idea that the locals constructing the stone structures as the outline of a ship they weren’t even consciously aware of, like something seeping through into the collective unconscious. It’s a nice idea, and it’s one that’s skilfully thrown out there quickly, with a minimum of fuss. Beatrix Lehmann is great as Professor Rumford, clearly having a great deal of fun as a lovely old lady caught up in ridiculously large adventures. There’s something hilarious and yet impressive about her take-no-nonsense granny, and she actually has much better chemistry with Baker than Mary Tamm does. In my head, there’s an alternative season where Baker’s Doctor and Lehmann’s Professor quest for The Key to Time, foiling evil-doers as they go. I know I’dwatch that show. There’s also some nice meta-commentary buried within the episode, extending beyond the homage to the two genres. I like, for example, the Doctor offering Romana advice on her footware. “But I quite like them,” she protests. “Well you please yourself,” the Doctor concedes, “I’m no fashion expert.” Later on, his point becomes clear, as a native observes, “Yes, they’re not very practical, are they?” It’s the type of low-level self-awareness that wouldn’t seem out of place in a regular episode, so I’m not sure that it counts as a celebration of a mile stone. On the other hand, I do like the script’s observations about gender in the series. When Tom Baker runs off to do more interesting stuff, leaving Romana with the two local women, one observes, “Typical male – strands you here in the middle of nowhere with two complete strangers while he wanders off to enjoy himself.”You could very easily read the line as a feminist criticism of the entire concept of the familiar Doctor Who plotting structure: young girl put in unfamiliar situation, young girl discovers more by screwing up, Doctor saves young girl. It’s hardly an unfair criticism, to be frank – even with the stronger female companions. Hell, it’s telling that the script features lots of strong female characters and (excluding the Doctor) only two relatively minor male characters (a cult member who dies fairly swiftly, and a subservient alien intelligence). It’s also, perhaps, very telling that the female villain empowers herself with a very large and phallic stick. While not unheard of in the series until this point, a female villain is still notable enough to be worth of comment here, especially one who seems as calm and rational as the Cessair of Diplos – female villains on the show often prone to screaming and ranting and raving, falling into that stereotypical sexist portrayal of women being overly emotional. Finally, I think that the image of the Doctor pushing Romana off a cliff while she falls into the old companion routine of screaming (as in the original cliffhanger) is an image that could easily be interpreted as a criticism of the show’s portrayal of the male-female relationship between the Doctor and his companion, years before discussing the show’s sexual politics become common-place. after all, it’s a very physical representation of the way the doctor plucks young women out of their lives and drops them in foreign and dangerous situations – it’s a wonder so few have died and (if they did), the guilt would rest with him. These are interesting ideas, and I enjoy thinking about them. However, they can’t help but feel like footnotes in a far more bland little adventure. It’s functional and not terrible, never descending into the realm of being actually bad. Still, for a story intended to celebrate the very best of the show, it winds up remarkably average.